Detroit Lakes sits 200 miles northwest of Minneapolis, 45 miles east of the North Dakota border and nowhere near the epicenter of the hockey universe. For much of last winter, however, NHL and college scouts converged with by-the-clock regularity on the resort town with a population of 8,000. They were there to dissect the exploits of Tanner Lane, the scoring phenom with ample size (he’s 6-foot-3 and growing) and exceptional speed (he’s the Lakers’ fastest player). Lane, who for long stretches of last season sat atop the state’s scoring list, impressed all the right people. On the heels of his June 26 selection in the NHL Draft by Atlanta in the sixth round (160th overall) he accepted an offer to attend Nebraska-Omaha on a hockey scholarship. Not bad for a kid who has yet to complete his senior year of high school. “We had lots of scouts out watching our games last year,” Detroit Lakes coach Chris Denardo said. “You’re thinking NHL when you’ve got a kid who is 6-3 and has the wheels and the hands. 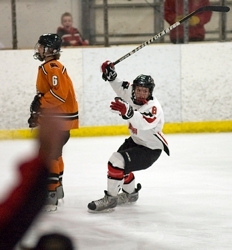 Lane, who scored 49 goals and had 90 points in 26 games last season, is Detroit Lakes High’s first NHL draft choice since Bob Caulfield was selected in the fifth round (84th overall) by the New York Islanders in 1983. Barry Tallackson and Jake Brenk grew up in Detroit Lakes and were NHL draft picks, but neither played their high school hockey for the Lakers. Garrett Raboin, a standout senior defenseman at St. Cloud State last season, is a Detroit Lakes graduate but wasn’t an NHL draft selection coming out of high school. As for college choices, Lane turned down overtures from the University of Minnesota and St. Cloud State to play for International Falls native Dean Blais in Omaha. The Mavericks will be playing in the Western Collegiate Hockey Association this season for the first time. As for Lane’s immediate future, that’s still undecided. He’s been working out with a personal trainer, eating healthy (“fast food isn’t part of the meal plan for me”), playing golf (he was the Lakers’ No. 1 player this spring) and will attend a tryout camp for the United States Hockey League’s Fargo Force in late July. After that he’ll decided whether he’ll return to Detroit Lakes for his senior season. Lane said Blais and Mavericks assistant coach Mike Hastings haven’t tried to influence where he should play next season. “They told me it was my decision to make,” Lane said. Blais, who led Roseau to the 1990 state championship and won two national titles as the head coach at the University of North Dakota, most recently guided the U.S. national team to the championship of the World Junior Championships. “He’s kind of intimidating with his resume,” Lane said about Blais, who played at the University of Minnesota. “He’s pretty straightforward about it. He tells you what he thinks of you.